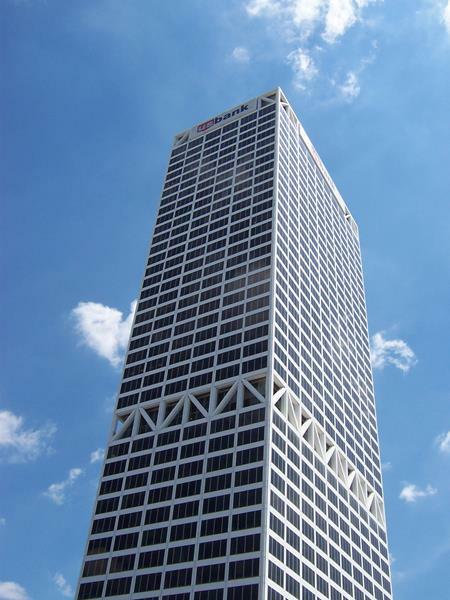 The US Bank Tower has been Wisconsin’s tallest building since 1973. Once Milwaukee’s tallest by far for decades, several newer 30 story-plus buildings give it some company and created a fuller skyline that the US Bank Tower highlights rather than dominates. The US Bank Tower rises 42 stories; it is 601 feet from street level to the roof. The cross-bracing horizontal rows at floors 2-3, 16-17 and 41-42 give the building its distinctive look. Constructed from 1971-1973, it’s still the tallest office tower between St. Paul and Chicago (the cities, not the nearby streets.) It has 5,000 windows and encompasses 1.3 million square feet of space – mostly offices. A lower atrium features shops, places for workers to eat and drink, and connections to nearby buildings via several skywalks. Milwaukee’s skyline is growing, but the US Bank Tower remains the city’s tallest. The US Bank Tower can be seen from 25 miles out in Lake Michigan. From the road, you can spot it from I-41/94 at the Milwaukee-Racine County line coming in from Chicago. It can even be seen from I-41 southbound near Highway 60 way out in Slinger, where elevation offers a long vantage point to downtown, especially when there are few leaves on the trees. When Allan H. (“Bud”) Selig was Commissioner of Major League Baseball, he maintained his office in the tower (33rd floor, if we remember correctly), so in a sense the headquarters of MLB was in Milwaukee for two decades. The US Bank Tower used to have a public observation deck on the 41st floor but it was closed to protect peregrine falcons, which have a hacking box up there for birthing and nesting. 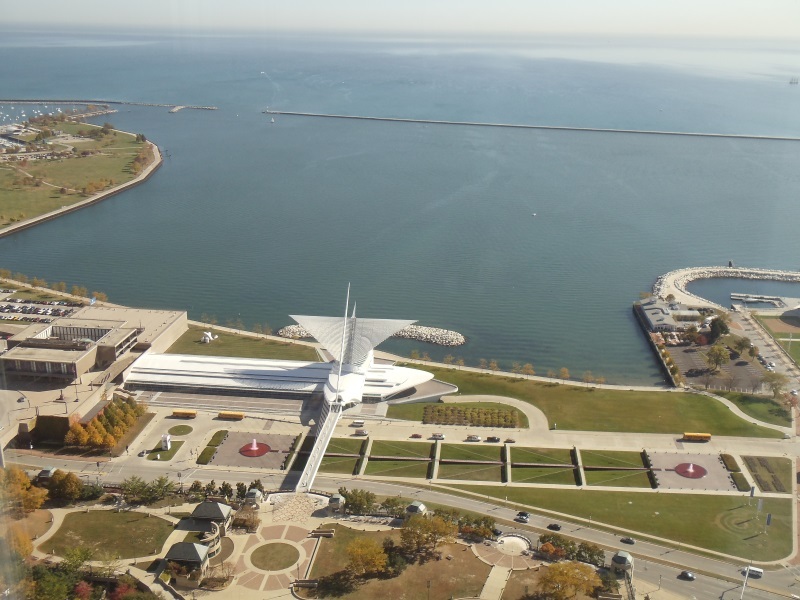 From the 40th floor of the US Bank Tower, you can easily see the Milwaukee Art Museum’s distinctive “wings” and quite a ways out into Lake Michigan. The US Bank Tower is easy to spot, of course. The building is close to a ton of key attractions in Milwaukee, including Discovery World, the Betty Brinn Children’s Museum, Summerfest and Henry Maier Festival Park, the Historic Third Ward, the Milwaukee Art Museum, and many more. The view it from I-794 and the Hoan Bridge is part of a fantastic city skyline view. U.S. 18/Michigan Street literally runs under the building’s atrium, and Highway 32/Milwaukee Street is just a few blocks away. I-43, I-94, and Highways 38, 57, 59, and 145 all come within a mile of the building.